Jones Auto & Towing provides Parrish FL tow truck services on the fly! Contact Jones at 813.299.7000 for fast assistance. 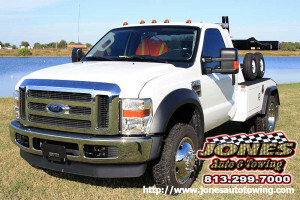 Jones is your one stop shop for any of your towing needs, you can trust them to show up on time and charge you fairly. We can help you with a flat tire, vehicle lockouts, fuel delivery, jump starts, all 24 hours a day and 7 days a week! There isn’t much that we CAN’T do for you or your vehicle. No matter what you’re driving or what services you need, call us at 813-299-7000 and see if we can help you out! Also if you like you can submit questions through our contact page. Full Service Towing In Parrish, Florida. What exactly do we do at Jones Auto & Towing? Well, besides living in the Parrish FL area since 1995, we’ve been providing the highest quality towing services all around the Greater Tampa FL area. Our high quality of service is available to both visitor and residents alike! Anyone who needs a tow can get one. If you don’t see exactly what you need listed anywhere on the site, do not fret! Just give us a call and see if we can help you in any way, we are capable of more than you may imagine. BUT if we can’t help you ourselves, we will do our very best to see that someone capable does. This is a rather limited listing of our services. We’ve been in the towing business since 1995, so even if you don’t see a service listed chances are that we know how to handle it or know someone who does! You can call us at 813-299-7000 for more info. Emergency after hours towing services do come at a higher cost than a normal tow. If you ever find yourself needing towing services in Parrish Fl, we are your go to! Being stranded on the side of the road, especially in an unknown area, can be quite terrifying. So, local or first time vacationer alike, let’s see if we can help you out with a speedy response. Jones towing maintains a top of the line fleet, our experienced drivers mixed with the highest quality materials and equipment means we’ll have you on your way as quickly as possible.